Faraday: I wasn't named after a famous physicist for nothing, you know. 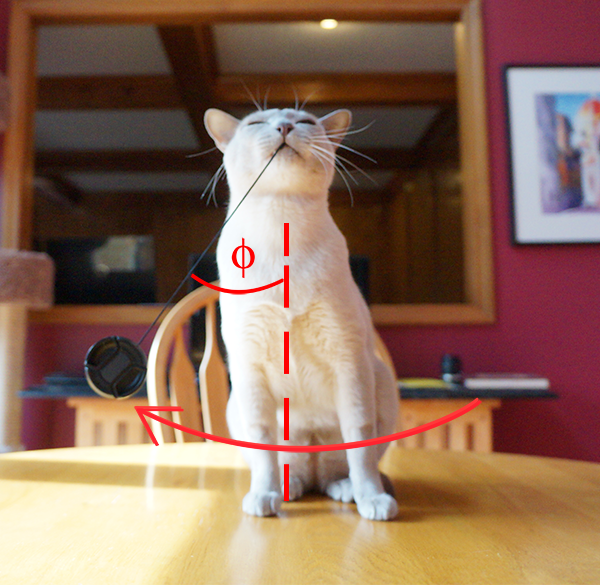 Just take a look at this: here you see me demonstrating that the period of a pendulum is independent of amplitude. 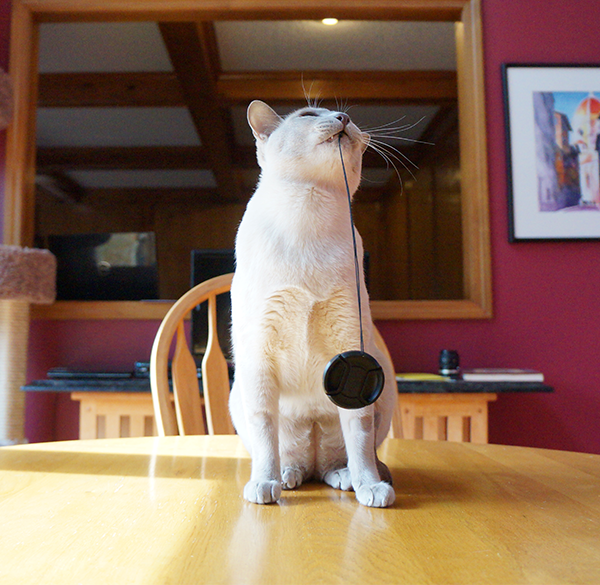 Maxwell: Yeah but dood, anyone can swing momma's lens cap (when she's not looking). You're obviously the Theorist in the fambly. Faraday you are quite the boffin. Hope mum is feeling better. We send healing vibes. Have a marvellous Monday. MOL! Mommy had to explain "boffin" to our dad! SCORE! We are extremely impurressed, Faraday! Mommy's back to work today (boo) making green papers to buy us WAND Toys (yessss!). Purrs to your mom to feel better soon, though! Wes LOVED all thje math! Your Daddy is funny. And wes is sending heathy purrs for your Mommy! trout = 2 pies with largemouth bass & grazz !!! MOWZERS, all this time, we thought L = length and g = gravity. We like GRASS muuuch better! You two are hilarious! And way smarter than Binga. Purrs to your human - I hope she feels better soon! We think that motion was rapidly damped, and the cap needs a good whap to drive it. Simply done, but perhaps without brotherly harmony. oh Faraday you look so pleased with yourself. Yes, that's what we thought too. Mommy snickers every time she sees Faraday's smug expression! Faraday purrs to your Momma. Oh wow we were totally lost reading about amplitude and displacement from equilibrium. HUH? We did love watching you play with the camera lens and though that was a very cool new toy! Doods...you lost us at physicist. We hope your mom is feeling better soon. MOL! Sorry, we just had ta geek out on this one. *wink*! Faraday, Your man human is going to be seriously in trouble for letting you have that cap.. And, how did he get you to swing that cap? You look marvelous doing it, but when momma yells at you, point your paw at daddy for letting you. 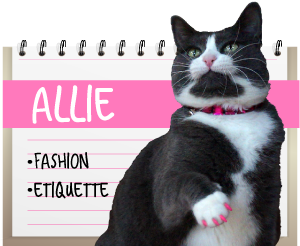 Allie: TOLD you, Brat. 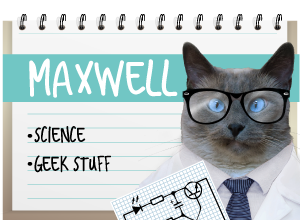 Maxwell: nah, he'll cover for us. All in the name of SCIENCE! Nobody said there was going to be math! We hope your Mom feels better soon so there are more words and less math. And so she feels better, too. Nice job Dad - Purrs to feeling better soon Mom! Heheheh, every once in a while, the geek just hasta slip out and do the mad dance around the blog! Hahahaha! Well we will just comment on how dang adorable you look! Mom says uncle Korey will have to explain the theory to us! You know, we've (rather Mommy has) often wondered about your name, Faraday...and do you know Mommy HAS derived that equation! *HIGHPAW* our mom too! She's so weird, she thinks it's FUN to geek out rom time to time!! BTW are you going to BlogPaws? Mommy's speaking there this year! WOOT! Well, your daddy sure must be smart! Great photos of you Faraday! Hope your mom feels better. Shhh-hh-h, what mommy doesn't know won't hurt us--- err, HER. Plus one and shared on Pinterest... if only math teachers were this interesting... we wouldn't have students questioning why Math is applicable in their lives. 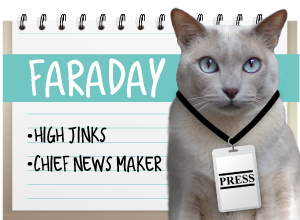 Faraday: FANKS you, haopee! We agrees! Faraday, you are srsly intelligent!